"Come on . . . just this once . . . I need somebody to throw the ball so I can practice hitting it. Please come outside and play with me," Zach begged his brother to no avail. Zeke was curled up on the big overstuffed chair with a book in his hand. "You always interrupt me right in the middle of the good part!" Zeke complained. Their older sister, Ann, came into the room when she heard the two boys squabbling. "It's all right Zach," she said. "I'll go outside and pitch a few balls for you." "I just don't understand Zeke," Zach complained to Ann as he picked up his bat. "I just don't know why he has to stay inside reading those dumb books all the time. He just doesn't know how to have fun is all I can say." "Well, Zach doesn't think those books are so dumb, and he's the one making the good grades in this family," Ann replied. "You two boys are so different. It's hard for me to believe that you are twins, and I've lived with you all your life!" "I know," Zach said. "Sometimes I even have a hard time believing it myself. Somebody at church said we are a lot like Jacob and Esau! . . . Hey! Let's quit talking. Pitch that ball!" Ann picked up the ball and threw a perfect pitch. Zach gave it a good whack with the bat and sent it sailing over Ann's head and beyond second base. Ann went running after the ball while Zach made his way around all the bases and onto home plate. Meanwhile, Zeke was still curled up with his book anxiously awaiting the discovery of the hidden treasure. 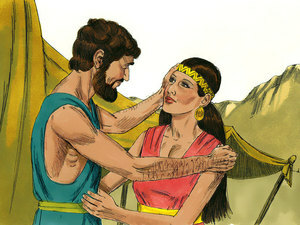 Isaac dearly loved his wife Rebekah and provided very well for her. He had inherited everything that belonged to his father Abraham, and he was a very wealthy man. There wasn't anything he wouldn't give her, and there was nothing he wouldn't do for her. Isaac and Rebekah lived very happily together, except for one thing. . .
Rebekah was sad because she didn't have any children. Every time one of her friends had a new baby, Rebekah would be glad for her friend, but inside, her heart ached. "Why, oh why, can't I have a child?" she wondered. "If only I had a child . . . . I would love him so much and would never let anything bad happen to him." Her loving husband Isaac saw her sadness. He would put his arms around Rebekah and try to comfort her. "You know I will give you anything you could ever want," he said to her. "I don't know why we can't have a family like the rest of our friends, but I will pray for you." After he was sure Rebekah was feeling a little bit better, Isaac would go to his special place to pray. "Lord, please comfort my wife Rebekah. Help her to feel better and take her sadness away. You know how badly Rebekah and I want children. You promised to bless us and make us a blessing. You promised my father Abraham that he would have many grandchildren. How can that be if Rebekah and I don't have any children?" Months and years went by, but nothing changed. Isaac kept praying to the Lord and trusting Him to keep His promise. He kept praying that Rebekah would be happy. He kept praying that they would have children. Sometimes it seemed that God just wasn't going to answer his prayers, but Isaac never gave up. For twenty long years Isaac continued to love God and pray to Him. Rebekah started feeling sick and was in much pain. She went to her special place to pray. 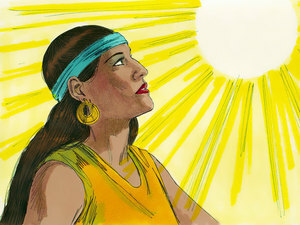 She cried out to the Lord, "Why is this happening? Why am I so sick and in so much pain? What's happening to me?" The Lord had compassion on Rebekah and spoke directly to her: "You are going to have twins. Even though they are twins, they are going to be totally opposite of each other. They won't look alike, they won't talk alike, and they won't like the same things. There will be a struggle between them and that struggle has already started. One will be stronger than the other, and the younger one will rule over the older one." "Isaac! ISAAC! Come quick! I have great news!" Rebekah shouted. Isaac could tell from the sound of her voice that it was something extremely important and came running as quickly as he could. "What? What is it?" he asked as soon as he could catch his breath. "Isaac! OH, ISAAC! We are going to have children!" She was so excited she could barely get the words to come out of her mouth. "God has finally heard and answered our prayers. We are not going to have just one baby! We are going to have two! OH, Isaac! I can hardly believe it!" As they reached out and hugged one another, big tears of joy streaked down both of their faces. They thanked God that even though they were quite old, they were finally going to be parents. God had heard the cry of their hearts and was going to bless them with two little baby boys. Rebekah didn't remember ever being so happy. Her face was radiant as she went about her daily chores and made special preparations for her tiny new babies. Even though she was in a great deal of pain, nothing could take away her joy about finally being able to be a mother. The joyous day finally arrived. 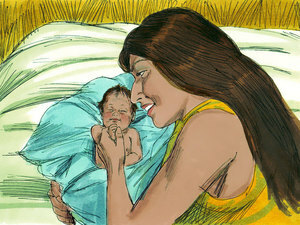 The first baby boy that was born was reddish in color and had a lot of hair all over his body. Isaac and Rebekah named him Esau. The second baby boy was light-skinned and gentle in nature. As soon as he was born, he reached out and grabbed his brother's heal. His parents named him Jacob. As the boys began to grow, the parents noticed great differences in the two children just as God had told Rebekah. Esau was a rough and tumbly little guy. He loved to be outdoors. He liked getting dirty, climbing rocks, and hiking. When he grew older he became a fantastic hunter. 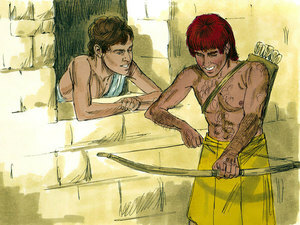 Isaac loved Esau's rambunctious ways and enjoyed the wonderful meat he would bring home from his hunting trips. Esau was definitely his father's favorite child. Jacob was totally different. Jacob was a quieter little boy who liked to stay around home. He enjoyed cooking and knew how to make a most delicious stew out of the vegetables he grew. Even though he stayed around home, he grew to be very strong and did an excellent job taking care of the farm animals. Rebekah could always count on Jacob to help her any time she needed him. He never ventured too far away. Although she loved both of her children, Jacob was definitely Rebekah's favorite child. 1. Why was Rebekah sad? 2. How long did Isaac wait for his prayer to be answered? 3. What did the Lord tell Rebekah? 4. What were the names of the two babies? 5. How were the twins different? and He will answer yours, too. "And Isaac intreated the Lord for his wife ..." (Genesis 25:21a). prayers. In Jesus' Name. Amen.